Penny auction sites with free bids give you an opportunity to test drive each site’s auctions, delivery speed, competition, and other features without spending money. It is a risk-free way to determine whether you would like to get more deeply involved with a particular site. A lot of people misunderstand the way penny auctions work. Bids cost money, and are rarely refundable. This means you can potentially lose money if you fail to win an auction. It is one of the reasons we encourage people to always take advantage of the free bids at penny auction sites. On this page, we’ll provide a list of the best penny auctions with free bids. You’ll learn how many bids you’ll receive at each site as well as where you can use them. If there are any major restrictions regarding their use, we’ll provide those details, as well. The sites on our list are those with which we are the most familiar. We have reviewed them thoroughly to test their customer service, bidding interface, bidding tools, and many other features. These are the sites we use. Before getting started, we encourage you to read our detailed reviews of the top penny auction sites. Our favorite site is HappyBidDay.com. As noted above, they are smaller than their competitors, which means they work harder to attract new members. One of the ways in which they do so is to offer more free bids than people can find elsewhere. For example, HappyBidDay is currently offering 50 free bids when you create a new account. This is more than fifteen times the number of free bids currently offered by QuiBids.com. Our advice? 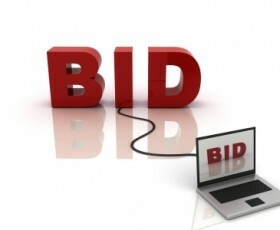 If you’re looking for free bids at penny auction sites, visit HappyBidDay first. They offer much more than just free bids at registration (we’ll explain below). The details in the following list are bound to change. Penny auction sites regularly adjust their promotions to better accommodate their members. Additionally, new sites burst onto the scene seemingly every month. We’ll update the list below with the latest information regarding free bids at penny auctions on an ongoing basis. HappyBidDay.com – In addition to receiving 50 free bids for registering, you’ll also receive 25 for logging in to your account each day; 30 for each friend that signs up; and 100 more on your birthday. They’ll also give you between 5 and 50 free bids for each bid pack you purchase. The free bids can only be used in the “Happy Auctions.” These are auctions through which you can bid for gift cards, small electronics, and additional bid packs. QuiBids.com – You can receive 3 free bids when you register and sign up for their newsletter. QuiBids also hosts daily free bid giveaways for existing members as well as contests in which you can win bids. You can also receive free bids by encouraging your friends to register and buy a bid pack. The free bids can be used at any of the auctions at QuiBids. However, it is worth noting that bids given as part of promotions usually expire within 7 days. SkoreIt.com – SkoreIt provides new members with 16 free bids. They also offer free bid packs periodically for completing certain tasks. For instance, a current promotion promises 5 free bids for tweeting or posting on their Facebook page. You’ll need to send an email to their customer support to let them know you participated. The free bids can be used in any auction. However, they can expire at any time without warning. BidCactus.com – At BidCactus, you’ll receive 16 free bids for registering a new account. The site also offers free bids for a host of other items. For example, you can earn 5 for referring a friend; 25 for completing an offer with one of BidCactus’s partners; 5 for buying a 50-bid pack; 10 for posting a YouTube video of yourself after winning an item; and 25 more if your video is chosen at the end of the month. Free bids from BidCactus can be used in any auction. Keep in mind they expire one year after they are credited to your account. Beezid.com – You’ll receive 10 free bids automatically when you register at Beezid.com. But you can earn many more by participating in contests and referring your friends. For instance, Beezid organizes daily contests on their Facebook page. One day, they might ask you to guess the final price of a particular item on auction; the next day, they may ask you to guess the number of bids. If you win, you’ll receive free bids. (They also hold contests throughout the week on their Twitter account.). Beezid will also give you 25 free bids when you refer a friend who registers an account. If that friend purchases a bid pack (any size! ), you’ll receive another 200 free bids. The bids can be used only in the “Cherry Auctions.” These are auctions that are reserved for those who have yet to win an auction. Whether you’re new to penny auctions (if so, read our Bidding To Win strategies) or an experienced bidder, take advantage of the free bids at penny auction sites. They offer a great way to participate at the sites of your choice without risking your own money.